Jeremy Hazelbaker led off the bottom of the ninth with a walk, putting the tying run on. Jackie Bradley, Jr., who had Pawtucket's only two hits heading into the inning, dropped a single into left, advancing Hazelbaker to third. After Brock Holt was hit by a pitch to load the bases, Ryan Lavarnway, lifted a sacrifice fly that knotted the game at one. Mark Hamilton then delivered the first hit of the day that didn't come off the bat of Bradley - but it was Bradley who raced in with the winning run. The win, combined with a loss by Rochester, gives the PawSox a 3.5 game lead in the North Division with seven left to play. Pawtucket will attempt to finish the sweep against Scranton tonight. 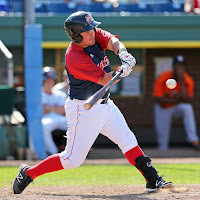 Portland continued to hold onto its longshot chance at the playoffs with a 10-5 victory against the New Hampshire Fisher Cats (TOR). J.C. Linares (pictured) led the way with a monster day at the plate. The right fielder launched a pair of three-run homers, one in the seventh to give the Sea Dogs a 7-5 lead, and another in the ninth to put the game out of reach. Several players had multi-hit games as part of Portland's 13-hit attack. Those include Garin Cecchini and Christian Vazquez, who had matching lines, both going 2 for 4 with a double and walk. The offensive outburst made a winner out of Mickey Pena, despite an uneven performance. The left-hander allowed five runs on eight hits, including two round-trippers, in 6 2/3 innings. Noe Ramirez came out of the bullpen to slam the door, allowing just one baserunner on a hit-by-pitch in 2 1/3 innings. With eight games remaining, Portland moves within a game of New Hampshire for third place in the Eastern Division, and within four games of second place Trenton for the final playoff spot. Fortunately for the Sea Dogs, all of their remaining games are against the teams they are chasing - they have three more games in New Hampshire, and finish the season with a five-game series at Hadlock Field against Trenton. Salem lowered its magic number to two with a 12-inning win over the Carolina Mudcats (CLE), 6-4. Down 2-1 in the seventh, David Chester walked in Stefan Welch to tie the game. Nick Natoli followed with a sacrifice fly that plated Blake Swihart, and Matt Johnson singled in Mookie Betts to open up a 4-2 advantage. Carolina fought back for single runs in the seventh and eighth, sending the game to extra innings. After matching zeroes for two innings, Salem plated two in a wild 12th. With two outs, Keury De La Cruz walked and advanced on a balk. Welch ripped a single to right to drive in the run, moving up to second on the throw to the plate. After a wild pitch moved Welch to third, Swihart hit what should have been an inning-ending grounder, but the first baseman mishandled it, allowing Welch to score an insurance run. Welch was on base three times for Salem, going 1 for 4 with two walks and scoring twice. Chester hit a solo homer in the third inning, his third since his promotion. Johnson added three hits. Mike Augliera delivered another quality start despite getting a no-decision. The righty allowed three runs on eight hits in 6 1/3, walking two and striking out three. Nate Striz and Matt Ott were excellent out of the bullpen, combining for four shutout innings. Salem is now six games ahead of Carolina for the last playoff spot with only seven to play. Greenville lost for the seventh time in eight games, falling 9-6 to the Charleston RiverDogs (NYY). Justin Haley allowed five runs, though just one earned, in five innings to drop to 7-10 on the year. Haley struck out four and walked one. Aneury Tavarez had a big game at the plate, going 3 for 4 with a double, a triple, a run scored and a RBI. Jesus Loya and Felix Sanchez added a pair of hits apiece. Lowell's narrow window to sneak into the postseason got even smaller with an 8-3 loss in 11 innings to the Aberdeen IronBirds. Ty Buttrey got the start for Lowell, giving up three runs (two earned) on three hits in 4 2/3 innings. He walked four and struck out six, a season high. Simon Mercedes followed, and was excellent in his first five innings of relief, allowing just three hits without giving up a run and striking out eight. However he tired in the 11th, giving up a solo home run to start the inning and allowing another to score, before Carlos Pinales relieved him with two on and one out. Pinales surrendered a three-run homer to the first batter he faced, as Aberdeen ran away with five runs in the inning. The tough loss overshadowed the work by Mercedes as well as some excellent performances at the plate. A pair of hits by Manuel Margot included a double, his fifth extra-base hit in five days. Forrest Allday had a 3-for-5 night, and Jake Romanski delivered his first double as a pro. With the loss, Lowell remains four games behind Tri-City for first place in the Stedler Division with seven to play. They are also four back of Jamestown for the wild card slot. The GCL Red Sox became the second Boston affiliate to punch a playoff ticket with a 7-0 win over the GCL Orioles. Bryan Hudson led the offensive charge. The left fielder was on base four times, going 3 for 4 with a walk and scoring a pair. Wendell Rijo was once again at the center of the action, going 2 for 4 and driving in a career-high four runs. On the mound, some rehabbing reinforcements helped seal the clincher. Pat Light, making his third rehab outing, gave up two hits in three scoreless frames. He walked one and struck out a pair, and is now unscored upon in six rehab innings. Daniel Bard, who was shut down on May 15 after struggling with extreme control issues, made his return to the mound. Bard walked one in his scoreless innings, adding a strikeout and allowing one base hit. Alfredo Aceves, Bard's old bullpen-mate in Boston, added a scoreless inning in his first appearance since being placed on the Pawtucket disabled list with an oblique strain in mid-July. After the rehabbing arms got their work in, the regular GCL staff continued to shine. Randy Perez fired three hitless innings, striking out four and getting credit for the win. Stephen Williams struck out two in a scoreless ninth. The DSL Red Sox opened up their best-of-three set with the DSL Giants with a 6-2 win. Dedgar Jimenez, who established himself as one of the better pitchers in the circuit with an outstanding season, got the call in game one and did not disappoint. The big right-hander allowed two runs (one earned) on just two hits in five innings to pick up the win. He struck out three and walked one. Daniel Gonzalez gave up just one hit in three scoreless frames, and Victor Ramirez fired a scoreless ninth to close out the victory. Luis Alexander Basabe led the offense, going 3 for 5, scoring a pair and driving in a run. Isaias Lucena was also on base three times, going 2 for 4 with a walk and two runs scored. The DSL Sox will attempt to close out the series at their home complex at 10:30 today. Player of the Day: As Portland keeps its slim playoff hopes alive, J.C. Linares had a huge game against one of the teams it needs to catch. Linares, who has had a difficult season bouncing between Portland and Pawtucket, had his first multi-home run game since last July 19. His seventh-inning three-run blast gave Portland the lead, and another three-run shot in the ninth put the game out of reach. The six runs batted in were a career high for the 28-year-old.